After what he described as a “frustrating and disappointing” start to the season, Milos Raonic has turned his year around with the help of new coach Ivan Ljubicic. He now finds himself within touching distance of a place at the Barclays ATP World Tour Finals going into the last chance saloon at the BNP Paribas Masters next week. It has been somewhat of a transition season for the Canadian, who, two years ago, travelled to the season finale in London to collect the ATP World Tour Newcomer of the Year award. After parting ways with long-time coach Galo Blanco in May, Raonic began working with former World No. 3 Ljubicic at the start of June and it heralded a new phase in the Toronto native’s development. “I felt like when I made the decision, I was convinced it was the right one,” Raonic told ATPWorldTour.com. “The approach has always been, when you’re going to do something, believe in it and go 100 per cent. That’s really what it came down to. It was just a little bit tough because it was in the middle of the season, just before two Grand Slams. As well as working with Ljubicic, Raonic also employed a new fitness trainer, Dalibor Sirola, who travels the tour with the 22 year old. Among the changes implemented are longer warm-ups, more focus on mobilisation of the body and attention to functional stability and movement. The results came quickly. 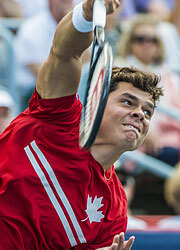 Raonic became the first Canadian to crack the Top 10 in the Emirates ATP Rankings after reaching the final of the Rogers Cup in Montreal, along the way defeating Juan Martin del Potro before ultimately falling to Rafael Nadal. He was the first homegrown finalist at the ATP World Tour Masters 1000 tournament since Robert Bedard in 1958. He narrowly missed out on reaching his first Grand Slam quarter-final at the US Open, falling to Richard Gasquet 7-5 in the fifth set in the fourth round, but excelled in the Asian swing, winning his second title of the season at the Thailand Open in Bangkok (d. Berdych) and reaching the final a week later at the Rakuten Japan Open Tennis Championships in Tokyo (l. to del Potro). ATP Tour Original Full Article can be found by clicking here.